Cognitive Dissidence: Walker Earned Those Demerit Badges! Scott Walker is again trotting out his bragging point of being an Eagle Scout when he was a boy. This time, he is using it to say it made him prepared to be Commander in Chief of the world's largest military. No, really! Walker pulled the Eagle Scout card in 2010 as well. I did a write up about how good of a boy scout he must have been - not a very good one at all. But I realized just how out of date it was, so I figured I needed to update it. The source for the following badges is here. American Business - That is a mixed bag for Walker. On one hand, he is a dutiful puppet for the big-moneyed, corporate special interests. On the other hand, his policies have forced a lot of small businesses to close down in the sinking economy. He has also pushed others out when he passed Right To Work. I'll call it a demerit. American Culture - This is an easy one. Walker has disrespected and/or attacked the tribes, blacks, Latinos and about every other minority in the state. An obvious demerit. American Heritage - Walker has tried to shred the Constitution. He has violated state and federal laws repeatedly. Hell, he can't even tell the truth about Ronald Reagan. Another obvious demerit. American Labor - Really? Act 10? Right to Work? How many demerits can he get for this one? Aviation - Does riding around the country in corporate jets while campaigning count? No? Then this is a demerit. Bird Study - Walker legalized hunting Sandhill Cranes. Demerit. Citzenship in the Community - At first glance, Walker should qualify for this one. He's been a state legislator, county executive and governor, albeit he has sucked at every one. But point six says he needs awareness of the importance of public services, like education, parks and transportation. That would make it a demerit. Citizenship in the Nation - Oh, there's that pesky Constitution again. Demerit. Citizen in the World - Walker has all but said he wants war with Iran. He also thinks robbing American workers and stealing their rights will scare terrorists. Demerit. Communication - It just says that he has to be able to communicate through speeches, etc. It doesn't say he has to be honest or even consistent. Walker gets his first merit badge. Computers - Two words: Secret router. Demerit. Crime Prevention - Walker commits crimes and associates with felons. Demerit. Digital Technology - See Computers. Demerit. Disability Awareness - Walker tried to close the Milwaukee Mental Health Complex when he was county executive. Now he wants to privatize long term care. He might be aware of the disabled, but he sure as hell doesn't care. Demerit. Energy - Walker is opposed to any and all forms of clean energy. Demerit. Environmental Science - Walker has weakened environmental protection laws and opened the state to hazardous frac sand mining as will as trying to ruin the Northwoods with an irresponsible iron mine proposal. He's paved over wetlands in order to curry favor with major businesses. Demerit. Fish and Wildlife Management - Sandhill Cranes, wolf hunts, Giggles the fawn. Demerit. Indian Lore - see American Culture. Demerit. Journalism - Walker controls the local corporate media. When faced with the national media who actually asks the hard questions, he runs from them. Demerit. Nature - See Environmental Science, Fish and Wildlife Management, Mining in Society. Demerit. Nuclear Science - The man cannot even pronounce the word "nuclear." Demerit. Public Health - Cutting BadgerCare, refusing federal Medicaid dollars. Demerit. Public Speaking - See Communication. Again, no need for honesty or sincerity. His second merit badge. Railroading - They don't mean railroading bad bills through. Think high speed rail. Demerit. 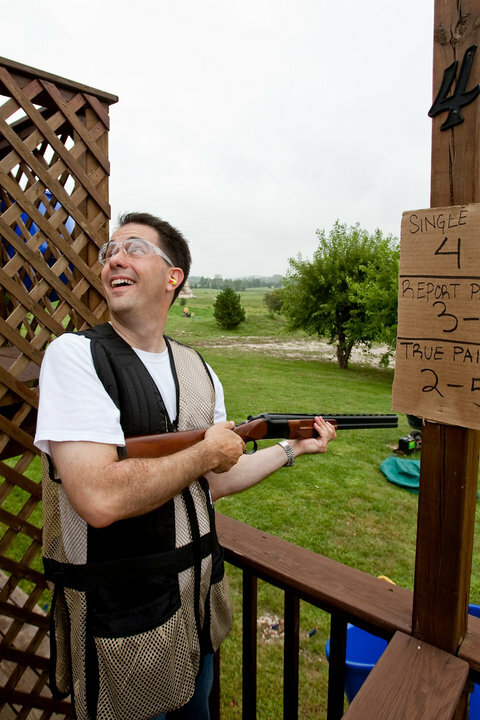 Rifle Shooting/Shotgun Shooting - Oh, please. Demerit. Sustainability - See Environment Sciences, Energy, Nature. Demerit. Too bad for Walker that the boy scouts don't give merit badges for the thinks he's really good at. Instead of rafting, they could have grafting. Instead of journalism, they could have propaganda. Instead of law, they could have skirting the law. In summary, if Walker thinks that being an Eagle Scout is something one continues to be, and if he sincerely thinks that it being an Eagle Scout is preparation to be in Commander in Chief, his own record shows that he is a lousy Eagle Scout and would make an even lousier Commander in Chief. Capper — Scott Wanker earned a chestfull of different Merit Badges!